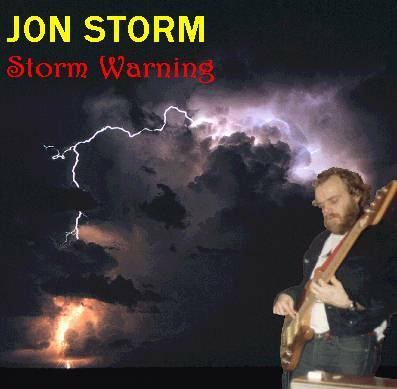 I was so thrilled when I received my copy of Jon Storm's new record, "Storm Warning" from across the Atlantic.� I just love the many changing moods of this gorgeous collection of songs.� His skilled use of synthesizers and delicate production techniques left me with a tingling warmth I've only gotten in the past from listening to Mike Oldfield or Peter Gabriel. The haunting "Odyssey" brings back some of the wonderful sounds of Ian Anderson's Celtic period during the 70s.� I enjoyed the lucid meanderings of Barton's guitar intermingling with the fretless bass sound... and, of course, the angelic voice of Jenny Lesle.� "Follow the Leader" offers an eclectic mix of synths and Wilson's guitar that make it such an interesting piece of pop music.� This record offers a nice variety of colors and textures.� I really enjoyed the traditionalist vocals of Jenny Lesle. � Jon's wispy, stylish choices as a synth player envelope and complement her singing style, which shines the most on "Ariadne." Much of this feels like a blend of modern electronica, trance and ambient type music; but the added surprises of melodic guitars toying with traditional folk is new and fresh! These musicians are quite skilled and very tight!� You can truly feel their connection to one another.� The instrumentals are equally as interesting and absorbing as the songs with vocals.� Jon lets us in on a glimpse into his deepest thoughts and you know he really put his heart and soul into this project. �This marvelous debut album is certainly a fine showcase for the talents of this multi-talented man. Sandy Frazier - Mystic-Art.com, September 2000. How to describe Jon Storm's wonderful solo album? Contemporary alternative binary folk music, perhaps. Gorky's with a hint of Fairport, thrust forth into the new millenium. A bit like Catweasel dropping into the heart of the "tribal gathering" (with a spiked drink). The Incredible String Band, in a big freaky electric spaceship steered by Sandy Denny, would probably set their dials for the heart of this particular Storm. Personal, oddball, beautiful and entertaining. A Wifty Wafty Fuzzy buzzy screaming dreaming edgy angry consoling and soulful Nantucket sleighride-ish piece of Art. Hard on the outside and soft on the inside. Yearning, burning, gentle and mental, mystical music. Many thanks to Jenny Lesle, Colin Wilson and Stuart Barton, without whose inspiration, encouragement and contributions this album could not have been made. Return to the Jon Storm index page, where you can download Storm Warning MP3s now!